Beyond Foods is a true handbook on how foods create health. Using a unique health model, Beyond Foods offers simple and easy to understand explanations of complex issues. With this information, anyone can create a healthy diet. Have you have ever walked down a health store aisle, with thousands of supplements, and wished you could magically understand which ones really work? Do you want to quickly and easily figure out whether a new fad food or diet is really good for you - or not? 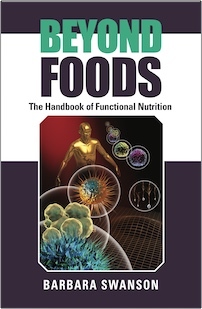 Beyond Foods: The Handbook of Functional Nutrition is a true handbook-short and easy-to-understand. It introduces The 4 Building Blocks of Health, a uniquely simple yet comprehensive health model that explains Functional Nutrition in layman's language. With its clear communication style, Beyond Foods successfully takes the very complex subject of how nutrition creates health and breaks it down into logical building blocks. Each building block is explained, using scientific facts, but in layman's terms. There are no broad opinions, just verified facts about how nutrition is meant to support your body's innate good health. Common sense is the guideline used to explain how you can find your best diet choices. Tips ad quick fixes to common dietary problems make this book immediately useful in daily life. You are not just told what to eat. You are given a clear understanding of why foods are good for you, or not; and this allows you to make ongoing choices in the marketplace long after the book is read. Beyond Foods is award-winning for excellence in the health genre. Beyond Foods is a must read for anyone wanting to take control of their health. Barbara Swanson does a masterful job of explaining how foods support health and healing. Her information is backed up by solid research that is cutting edge. In this day and age you are putting your life in severe jeopardy if you count solely on medical professionals and drugs to keep you healthy. Books like this one are so valuable to those who believe that healthcare is more than disease prevention. True health comes from eating well and having a healthy lifestyle. With sound knowledge about how the body works along with the addition of nutrient rich, super foods into the diet, it is possible to stay healthy and age gracefully. Thank you Barbara for writing this book. Clear, concise and to the point/s! This is the kind of booklet that should be handed out in every natural practitioner’s office. It really is this simple. At last! A concise primer on food and diet that will help people regain an essential connection with the natural world. 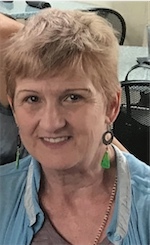 Barbara has been a health consultant for over 25 years. Her focus is on the tenets of Functional Nutrition.. This book is the result of thousands of hours of research and personal experience with how food works to create and support good health.